Beistle, Martin Luther (1875-1935), Shippensburg, Pennsylvania. Industrial Magnate, Inventor, Coin Dealer, Numismatist, Author. He was born on June 26, 1875, at Cumberland, Pennsylvania, the fourth son of David W. Pisle Beistle (1810-1884) and Mary Elizabeth “Molly” Redick Redding (1840-1892). The Beistle family comprised four sons : Walter Dewalt; John, William Oliver, and Martin Luther, and three daughters : Bess, Rebecca Jane, and Henrietta. Martin Luther Beistle was their fifth child. In January 1895, he married Anna Mary Amanda Dewalt (1875-1946), daughter of John Jacob Dewalt (1858-), the radial arm saw inventor. They had five children : Arthur Erwin (1895-1961), Ruth Amanda (1897-1975), Pearl Henrietta (1899-1995), Edna May (1901-1967), and Dorothy Elizabeth (1910-1996). Their first child was born at Pittsburgh, Pennsylvania, where Beistle began his career as a specialty salesman for the Pittsburgh Calendar Company. Sometime about 1900 he began his business, Beistle Company, as a sideline cottage industry making decorations for hotels, especially artificial plants, in his Cartier’s Township home basement factory on Walnut Street, with his wife Anna and brother-in-law. He continued working as a specialty salesman saving the company profits in order to expand into their own factory building. In 1904, he patented the Medicine Spoon, a spoon that had a bent handle to assist in liquid medication. According to the U. S. Patent Office Beistle filed the patent while living in Ingram, Pennsylvania. About 1905, he rented the W. W. McBride Paper Company factory where he worked as a salesman at Pittsburg. Late 1905 through 1906, the Beistle Company felt the crunch of the economy during its financial collapse and was forced to close the factory and relocate it returning to his humble origins in his basement. A lawsuit was filed against him on February 21, 1906, for attempting to defraud by evacuating said premises without payment. The original lawsuit by W. W. McBride Paper Company dated back to October 1905. In 1907, he moved his basement factory into his father-in-laws wagon shop. In 1909, he moved into a new factory location in Shippensburg, and began to publish a company catalog of the various novelty and party paper products. In 1910, he began making specialty paper items that catered to the seasonal market, specializing in Christmas decorations. He patented several processes in specialty paper manufacturing. 1910 U. S. Census, he was living in Southampton, Franklin County, Pennsylvania. Oddly, their daughter Ruth Amanda is not listed in the Census report. Around the birth of their last child Dorothy Elizabeth, they had a 17 year-old live-in maid Edna Geedy. His coin dealership operated also under the Beistle Company banner. About 1913, he began to specialize in early American half dollars. In 1917, he began to manufacture his famous honeycomb tissue paper for use in making various party items and seasonal specialty items like Valentines, and Christmas decorations. In 1919, he added his new line of Halloween items and paper products. In 1921, he added Easter paper product items to his catalog. He read a paper at the Rochester Numismatic Association meeting held September 19, 1922. In 1923, he conducted correspondence with David Proskey concerning the Confederate Half Dollar, since Proskey worked for Scott & Co. when they issued the 500 restrikes. Through this correspondence Beistle was able to learn the details about the restrikes. 1926 he helped purchase the Old Courthouse in Shippensburg for the Civic Club. 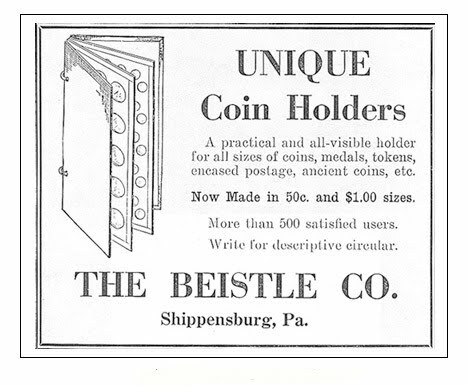 Early 1928, Beistle patented, manufactured and sold the “Unique Coin Holder” the first known cardboard coin-board album leaves that were hole punched to place in ring binders designed specifically for them. [See Figures 1 & 2] A transparent celluloid strip slid under the surface of each row of coin holes and could be pulled out for either the insertion or removal of coins. In the June 1929 issue of The Numismatist, an announcement gave notice to Beistle’s new book expected to be ready for subscribers by June 10th, warning that it will be issued in a limited edition, and a de luxe edition of only 25 copies. He received his copyright on July 25, 1929 for his book, A Register of Half Dollar Die Varieties and Sub-Varieties; Being a Description of Each Die Variety Used in the Coinage of United States Half Dollars as far as the Issues are Known, Covering the United States Mint at Philadelphia, and Branches at New Orleans, San Francisco, Carson City and Denver. By M. L. Beistle (Shippensburg, Pa., TheBeistle company, 1929). Sales of the book began in August and over the next few months was probably crunched by the Stock Market Crash of October 1929. Beistle used the neologism akcidefet for “clash marks” in his book, probably a conflation of two words modified, the first one derived from the German word for accidental "akzidentale" + the English word effect. Alan Herbert, Coin Clinic 101, says that it was a slang term for accidental die defect. Regardless, the term akcidefet is now considered an archaism and has been replaced with the word "clash marks"
In 1934, he added his new line of St. Patrick’s Day items and paper products. He died of a heart attack on January 11, 1935, one week after the death of Henry Chapman, Jr. He is buried in Spring Hill Cemetery, Shippensburg, Pennsylvania. The Beistle Estate sold his coin collection posthumously in two sales through Milford Henry Bolender, Sale No. 100, November 30, 1935, and Sale No. 103, April 18, 5 and 1936. The company remained as one of the nation’s leading die-cut paper manufacturers up to the present day. During WWII the company manufactured items needed by the government for the War Effort. After the war the company resumed its former business of manufacturing party favors and paper seasonal goods, etc. 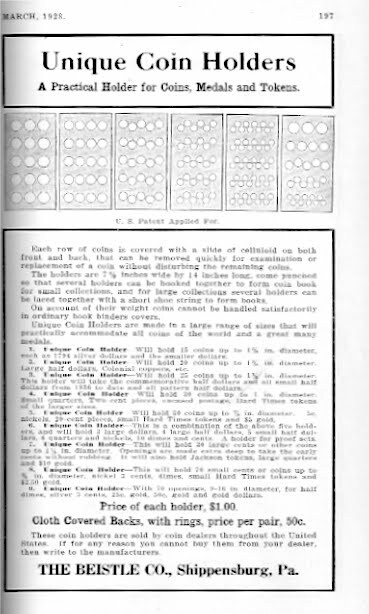 In 2009 the Numismatic Bibliomania Society conducted a survey of the 100 Greatest Items of United States Numismatic Literature, andBeistle's, A Register of Half Dollar Die Varieties and Sub-Varieties; Being a Description of Each Die Variety Used in the Coinage of United States Half Dollars as far as the Issues are Known, Covering the United States Mint at Philadelphia, and Branches at New Orleans, San Francisco, Carson City and Denver. By M. L. Beistle (Shippensburg, Pa., The Beistle company, 1929), ranked 64th on the list.